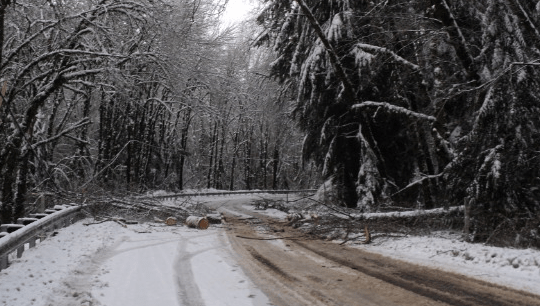 It’s been a year since a historic ice storm struck the Puget Sound region. Most “casualties” of the storm were local trees, many snapping like matchsticks from the weight of the unprecedented ice and snow. Another ice storm casualty was the hillside along eastbound I-90 near Preston and the Raging River Bridge at milepost 23. If you were driving that January 19th morning, you might have experienced first-had how the sliding, steep hillside blocked three lanes of traffic. Large fir trees tumbled down the moving mud slope and ended up on the freeway. One year later and the work to stabilize the steep hillside is wrapping up, along with work to hold back mud and debris if it slides again. The Washington State Department of Transportation hopes to complete the slope stabilization project in February, which will put that section of I-90 back to normal for commuters. The existing retaining wall designed to protect the freeway and cars in case of a slide was extended by 250 feet and a traffic barrier was constructed. Workers will complete the project by painting the wall and barriers to match the existing structure. Once finished, the right lane of eastbound I-90 near Preston, which has been closed since October, will re-open. In early January, the WSDOT estimated (rough) that the remainder of the work would take 4-6 weeks, but warned that the project is weather dependent.